The future is bleak and territory and resources are now what divides humankind as three mighty Companies vie for control of a remote area of the Galaxy and the treasures it holds; the war is endless and loyal pilots die by the thousands in this brutal battle. However, it is not only the divided factions of humankind that fight, terrifying aliens have emerged and battle against those who encroach on their territory and now you as a pilot of one of these corporations are met with enemies on all sides. 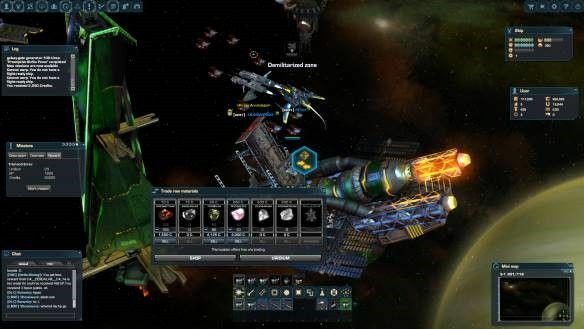 Dark Orbit Reloaded is the new and improved version of the original Dark Orbit space shooter MMO, a free to play game accessible through your web browser the game has been given a fantastic new 3D graphical upgrade to bring even more immersion and realism to the game. Now players will find themselves explore beautifully rendered 3D graphics in the same 2D environments with new and improved performance yet using the same loved gameplay and features as the core of the game is still fundamentally the same. The main premise of the game is for players to try and advance in the ranks of their own Company, by taking missions from their faction NPCs to take on challenging enemy AI opponents and discover and explore dangerous locales across the galaxy. Combat itself relies in mouse controls to move around and attack enemy ships using the keyboard to use various items and weapons, all of which can be crafted and upgraded in the players Skylab, a personal refinery that will allow them to repurpose the raw materials they locate, craft weapons, drones and other items and upgrade them. Starting out with a Phoenix ship, players will be able to get access to 11 different ships in the game using them to traverse the deadly maps of Dark Orbit and engage in both PVE and PVP. Many ships can be acquired using the standard Credits currency, but other more Elite ships that come with their own skills and features will require the more prized Uridium, a premium resource that can be acquired in game or bought with real money. The ship and the items players equip it with are only part of the customization that goes into Dark Orbit, players are also able to earn Pilot Points (PP) that allows them to learn and upgrade a variety of skills in their pilot bio, acquired by collecting log-disks, with 50 PPs max available (though it takes an increasing amount of log-disks to get each subsequent PP). The game boasts a variety of areas and features for PVE with general missions, but also bigger events like the Invasion Gate where Company’s compete against each other to try and kill the most alien invaders before the gate is shut down and the invaders repelled. Alternatively players may wish to participate in the fully fleshed out PVP system for individuals, groups, factions and Clans, who can all take advantage of various game modes including Team Deathmatch and a point control Sector Control game mode.